Our customers make use of Adobe Connect for many different use cases including training, sales, support, incident response, customer outreach, etc… One of the use cases that has been a problem in the past were meetings where a higher video production value was required. For instance imagine a meeting where a CEO and his team address partners or customers in a large scale event. In this scenario a webcam would not be appropriate, typically in these situations you will find that the production team has high end equipment and expects to be able to use it for this event. If you are not familiar with the difference ways to get live video into Adobe Connect, here is a short refresher. Adobe Connect supports nearly any webcam and for that matter nearly any video source as long as the drivers are well written and can be seen by Adobe Connect. That includes typical webcams and capture devices such as the Epiphan AVio. Capture devices have been the only way to bring video in from an external source (e.g. video conference device or high end camera) until very recently. In other words if you had a high end camera with an hdmi port or a video conference device with an hdmi port you could use a video capture device such as the Epiphan AVio to bring that video into an Adobe Connect meeting and display that video in the video pod. Of course the video capture device has to have the appropriate drivers. With that said, what if your external encoder/switcher/etc… could push out an RTMP stream but was not close to a PC with a video capture device. For some time I have been advocating for the ability for Adobe Connect to accept an RTMP stream from an external encoder such as a Newtek Tricaster. It would allow for more flexibility in the setup for streaming video through Connect and allow for higher production value use cases. Good news, I recently tested a new version of ManyCam and this version does accept an external RTMP stream. This means that a use case that requires an external encoder/switcher (Newtek Tricaster) that can publish an RTMP stream can now work with Adobe Connect. If you are not familiar with ManyCam , it is a live software switcher that works as a video source in a Connect Meeting, Seminar Room or Virtual Classroom. With ManyCam I can ingest multiple video and or content sources, switch between them, with transitions, and now one of those sources can be an RTMP stream. ManyCam can accept many different input sources including webcams, media such as images and video, IP cameras, etc… but for the purpose of this discussion I will only cover the new ability to use an RTMP stream as a video source. There are many ways to publish an RTMP stream that you may want to bring into a Connect meeting including Newtek Tricaster, SlingStudio, Wirecast, Epiphan Pearl, Matrox Monarch, etc…. In the past there was no way to bring these into a Connect Meeting, Seminar Room or Virtual Classroom. A simple diagram may help explain the relationship between the video source, ManyCam and Adobe Connect. I would assume that the people that have read this far have a need to bring an RTMP stream into Adobe Connect. I would also assume they already have a hardware or software video product that can publish an RTMP stream. If that is the case the setup is quite simple. First install ManyCam on the PC where the Adobe Connect client app is installed. In order to add an RTMP stream in ManyCam and have that stream display in an Adobe Connect Meeting, Seminar Room or Virtual Classroom. I am sure that I do not need to explain the value of video when used in nearly any training or meeting scenario. Because Adobe Connect makes it so easy to upload and stream video to an audience many people make assumptions about the outcome of sharing video, the participant experience. In this article I will attempt to identify issues with playing ondemand video as well as present solutions for those issues. The first step is to figure out what might go wrong and why. The great news is that there are many tools that can be used to identify issues. Since I am a Windows 10 user my examples and references will be based on Windows 10 but I have to assume that there are similar tools on nearly every other operating system. The problems that I run into typically fall into two categories: bandwidth and/or CPU (pc resources). Lets start with CPU as an issue to smooth playback of ondemand video. An easy way to test a video before you upload it to Adobe Connect is to simply play it locally to see if you can identify any issues. If the video does not play locally it should be obvious that it will not play well when streamed. If you know the answer to the question, how do I know if I have enough CPU/memory resources to play ondemand video, you can move to the next section. I have found what I think is the easiest way, which is to use the “Task Manager”. There are several ways to launch it including : right click on the task bar or Ctrl + Shift + Esc keyboard shortcut. Once it is open you will see several tabs. You can see from the image above that 87% of the CPU is already being used on running applications. Notice that Chrome is using ~52% of the CPU. Also notice that there are 37 tabs open in Chrome. If you play the video locally with little change in the CPU, Memory, etc… and it plays smoothly, that is a good sign. It should also be obvious that if the video playback takes 50% of the CPU, attempting to play that video with less than that amount available is not going to work well. Of course this simple test does not assure that this video will play back when streaming but it is a good start. Many people will assume that the size of the file on the hard drive is a determining factor in how a video will play, that is not the case. Of course it is not a good sign if you attempt to upload a 40 GB video, just for the fact that you will have problems uploading it. The critical measure for streaming video is bitrate (bits transmitted per second). Bitrate is typically displayed as Kbps/Mbps/etc… (e.g. 600 Kbps or 600 kilobits per second). Lets say that you have a 200MB video file but the bitrate was set to 600Kbps that video should play for most if not all participants in an Adobe Connect meeting, there are a few possible exceptions that I will cover later. I have found that bitrates for ondemand videos less than 1Mbps work for most participants. So how do you set the bitrate for a video? You set the bitrate when you encode or re-encode the video. There are numerous tools that can be used such as Adobe Media Encoder, Handbrake, etc… I have also written a very simple encoder that you can download from here. The simple encoder that I wrote makes some assumptions in order to make the encoding process as simple as possible. There is a short video that explains how to use it on the same page. It will create two versions of the video : good and best. Best requiring the most bandwidth. If you are planning to encoder video it is a very good idea to quit out of any non-essential applications as the CPU overhead for encoding can be high. Notice in the preceding image the CPU spiked to 100% of the available resources, while encoding a very short snippet of video. If you use a more capable encoder such as the Adobe Media Encoder you will see a setting called “Bitrate Encoding” that has a few options: CBR, VBR 1 Pass, VBR 2 Pass. Since you will be streaming this video from Adobe Connect always select CBR. In order to make this process easier when using the latest Adobe Media Encoder , I have created and made presets available here. These presets assume that the video is in a 16:9 aspect ratio. Now that we have tackled the two most prominent issues lets cover a couple best practices. There are many unknowns when it comes to the capabilities of participants in a Connect meeting. For any given audience in an Adobe Connect meeting you could have a wide range of bandwidth capacity, CPU, memory, etc… . You might find that some home users have more than enough bandwidth where some corporate users might have poor connections. Corporate users that have poor connections should make sure that they are not connected to vpn unless they have no choice. You could have everyone run the test link and / or report back their connection status from the connection widget in the upper right corner of every Adobe Connect meeting room but that might take some time. An alternative way to address bandwidth issues is to encode more than one version of the video you would like to play. In that way if the audience reports issues playing the video, you simply substitute the other lower bandwidth version. You might think that is a difficult process but actually it is simple. Just encode one version that is a fairly high bitrate (see encoding section in this article) say 1Mbps and another lower bitrate say ~600 kbps. Upload them to the content library or directly to the meeting room. There is an upload utility that makes upload a much quicker process here. The utility supports drag and drop and unattended upload, without it you have to upload each file separately. Now that the files have been encoded and uploaded you can add the second video to a share pod in the Presenter Only Area. If a number of participants are having trouble with the high bitrate video simply drag out the lower bitrate version from the Presenter Only Area. If you are really worried about any issues popping up with the video, create three or even four versions and upload them to the content library so that are ready to go when needed. I made a few changes to this custom pod. You can register to download at the bottom of this article. The new file will be called fp10VideoPlayer.zip. Some of the changes were simple bug fixes for instance there was a problem accessing a stream with an mp4 extension and prefix, that is now fixed. That means that you should be able to use this with a CDN such as Akamai. Another highly requested feature was the ability to resize the video, that should now be possible. I have not done a lot of testing so use at your own risk. In this article I will describe how to use a recently created custom pod for Adobe Connect. This custom pod is provided free of change and is provided as is with no additional support or warranty (how is that for some lawyer speak). Briefly, this custom pod allows you to stream high frame rate video from the Adobe Flash Media Server to an Adobe Connect meeting room. I used the collaboration sdk to create a shared experience. In other words if you are a host in a meeting room you can load and setup a connection to both live and ondemand video that you control for the meeting participants. As the host you make the connection and choose the video and when you hit play all participants will see that the video has started to play. This is very different than a typical video player where each individual has their own experience and could be watching different sections of a the same or different videos. This custom pod understands the different Adobe Connect meeting roles (i.e. host, presenter, participant). Only the host has interface elements (buttons, progressbar, etc…). Admittedly the user interface could use some work and I do intend to improve it so do not beat me up too bad but also do not hesitate to give me advice on improvements. The following is a simple diagram of the workflow. There are many considerations when ever you consider streaming high quality video. First of all the camera is an important part of the equation. I did a number of tests with web cameras and found that two of the three web cameras that I tested could not consistently produce 30 frames per second of video. Do not skimp on a quality camera. The second, third and fourth and and and considerations are all BANDWIDTH. You cannot stream a 500 kbps stream over a connection that only has 300 kbps available. There are many people that are confused about bandwidth but it is fairly simple. If you look at the diagram above you will notice that you have to send the encoded stream from the camera / laptop to the Flash Media Server and then on to Adobe Connect. You need the appropriate amount of bandwidth at each step. It is not enough to have a great connection from FMS (Flash Media Server) to Adobe Connect you also need an appropriate connection from the source (camera / laptop) to FMS. Often someone assumes that because their wireless card mentioned 54 Mbps that they are covered for streaming video. The key consideration is “usable bandwidth”. I have included the ability to test bandwidth in this application as well as a status indicator that will give you an idea if your connection is appropriate for the video you are attempting to stream. It is also important to note that available bandwidth changes continuously. You might find that you do a bandwidth test and have plenty and thirty seconds later you have half as much. It is best not to use a wireless connection as their is more variability and more unknowns with a wireless connection versus a wired connection. The first thing you should understand is that this is the interface that the host will see when they upload the custom pod. The dark green in the progress bar shows the progress of the playing video. The dark blue shows the size of the current buffer. If you do not see any dark blue then there is no buffer and you are probably not having a great play back experience. You will not see a progress bar for live video as there is not enough buffer to show. Notice the green status indicator in the upper left hand corner of the screen. This indicator will be seen by both hosts presenters and participants. This indicator shows only the local connection status. In other words if you are looking at this indicator it shows your status not a combined or status of other individuals in the meeting. The following table gives a brief highlight of the states and meanings. This indicates no connection. Each time you connect the indicator will turn green initially and each time you disconnect it will turn black. This indicates the initial connection as well as a video that has enough bandwidth to play and keep up with the video that is being sent from the Flash Media Server. This indicates that there are or have been issues with the video playback. Often times this is represents a temporary condition so do not panic the first time you see the indicator turn orange or red. This indicates that the issues are getting worse but as stated before this can be temporary so give it at least a few seconds and see if the condition improves. If someone in the meeting mentions that the video playback is not smooth or the quality is not great you could ask them what the color of the indicator is to get an idea if the problem is bandwidth related. This indicator does not indicate a change in frames per second. It is possible to retrieve fps data from the metadata of the stream but it seems that this does not indicate that actual fps on the passed on from the encoder (e.g. Flash Media Live Encoder). The first step to playing live video is to have a live video source. Keep in mind that if you intend to use a simple web camera your quality will probably not be that much better than what you would get out of the default camera support in Adobe Connect. If on the other hand you have a higher quality camera or would like a higher frame rate follow these steps. 1) setup a computer with enough horse power to encode the video and with enough bandwidth to send that video to the Flash Media Server. Download and install the free Flash Media Live Encoder. 2) setup or use an existing Flash Media Server. 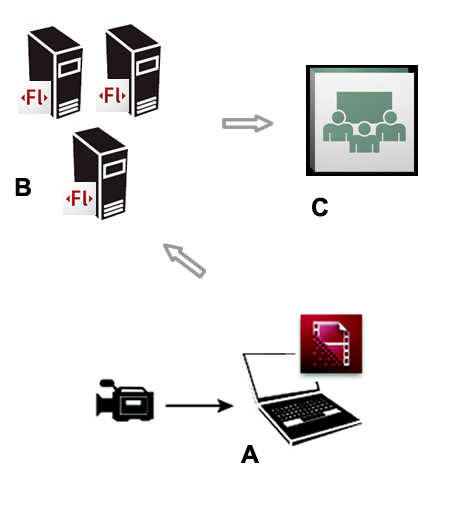 There are a great number of resources for getting started with the Flash Media Server. 3) upload the custom pod. The custom pod is in a zip archive. In a share pod in Adobe Connect simply locate the custom pod zip archive on your computer and upload the entire zip. 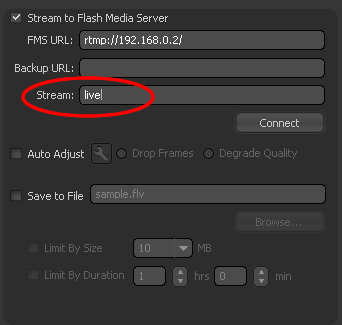 4) enter the server url and stream name for the video that you are publishing from the Flash Media Live Encoder. It is a simple matter to find the connection stream for the server. You will notice by the example above the entry field that it starts with rtmp. This is the realtime message protocol used by FMS. The next element in the connection stream is the server ip address or dns name. After the slash following the server name or ip address is the application name. This may seem a little strange but this represents a folder name inside the application folder inside the installation folder of the Flash Media Server. Once you have the Flash Media Server installed find the installation folder and open it and inside you will find the application folder. Inside of the application folder you will find a vod and live directory. These are the default applications. 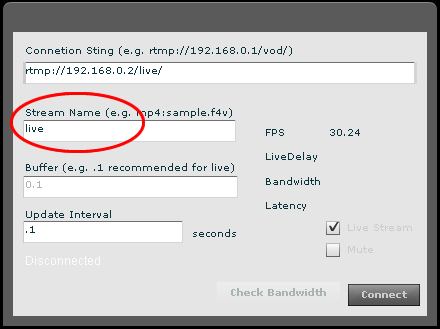 If we analyze the following connection url, rtmp is the protocol, the ip address is the address of the Flash Media Server and vod represents the default directory for ondemand streams (i.e. files) inside the application directory. The stream name is what ever the file name is for ondemand or what ever name you entered into the Flash Media Live Encoder. After the all the elements of the workflow are in place it is time to turn on the camera and stream the video from Flash Media Live Encoder to FMS. This is a pretty straight forward task, simply hit the start button in Flash Media Live Encoder. Once the live video is streaming to Flash Media Server it is time to connect to and play the live stream into the custom pod inside of Adobe Connect. This is the settings panel for the Custom Pod that you will use in the Adobe Connect Meeting room. It allows you to setup and make a connection to the Flash Media Server. It also allows you to choose between ondemand and live streams and test your bandwidth. Notice that the stream name is the same as the the stream field in the Flash Media Live Encoder. If these do not match you will not see video in the custom pod. Also notice that if you want to view live video you must select the Live Stream check box. Well I think that about covers it. I will post the link to down load the custom pod later today along with a few other links that might be helpful. Please drop me a comment to let me know if it is working or not and any improvements that you would like to see. I put together a short overview presentation of the custom pod functionality and setup. If you would like to jump right to the link that allows you to register for download it is on slide eight. Please let me know what you think. Note: If you are having trouble with the registration page clear the cache on your browser and reload the page. Some of you may know that I have tried my hand at encoding video. I have come up with settings that I have found work fairly well in Adobe Connect. With that said I have always turned down the quality of the audio but wondered if people actually noticed. I found an article with audio samples that tells me that they may not. Give it a try and let me know how you did on the tests. For some time I have been looking at ways to expand the use of high end video cameras with Adobe Connect. There are many reasons to consider higher end cameras not the least of which are optics, sensor size and quality, features, etc… If you need convincing the following should help. 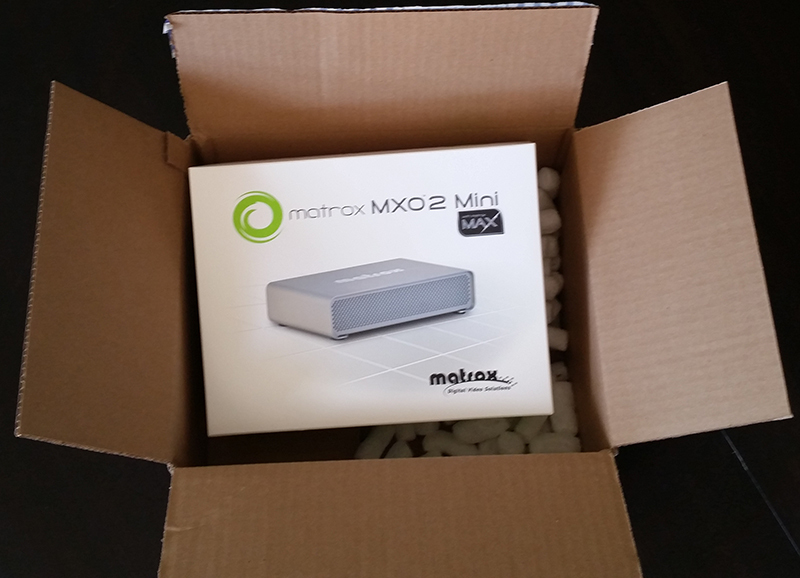 I was recently given an opportunity to test the Matrox MX02 Mini and jumped at the chance. What better way to test it than with my Canon 5D Mark III. I have really enjoyed using this camera for both stills as well as video. The Matrox MX02 mini gave me the opportunity to see how the Canon camera and Adobe Connect would work together. The initial setup was fairly easy. I requested the model that came with a ExpressCard/34 adapter so that I could use my laptop. On a slightly humorous note my laptop only has a full size ExpressCard slot so a little adjustment was required. It turns out that cardboard like duct tape has many uses. This was obviously not a short coming of the MX02 Mini but none the less easily overcome. I decided to use the HDMI input for the test. The Canon 5D Mark III requires a mini HDMI connector. I thought I had every adapter made but it turns out a mini HDMI was not one of them, a quick trip to Fry’s fixed that problem. There is software to install for this setup to work. The installation was easy and included a number of applications. 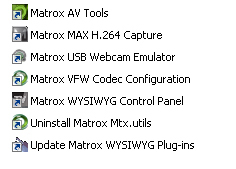 With that said in the end the only software I used was the Matrox USB Webcam Emulator utility. 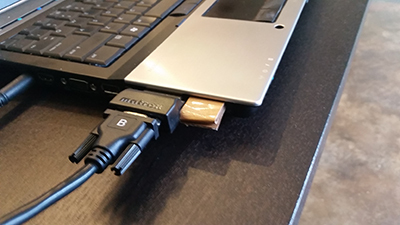 As you might expect this utility allows the MX02 Mini to appear to the PC as if it were a webcam, making it easy to use with Adobe Connect. 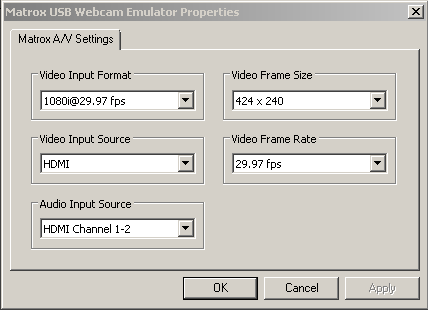 There are five popup boxes in the USB Webcam Emulator: Video Input Format, Video Input Source, Audio Input Source, Video Frame Size and Video Frame Rate. The first three, as expected, have to do with the video device you have connected to the MX02 Mini and the last two have to do with the video output from the MX02 Mini. I set the output on the Canon camera to 1920 @30 fps (frames per second) IPB. In the Matrox USB Webcam Emulator I set the Video Input Format to 1080@29.97 fps. Since I used HDMI I set the Video Input Source to HDMI and the Audio Input Source to HDMI Channel 1-2. I did not test the RCA left and right for audio input source. Adobe Connect supports six input resolutions, three for a 4:3 aspect ratio and three for 16:9 aspect ratio. The 4:3 resolutions are: 160×120, 320×240 and 640×480. The 16:9 resolutions are: 214×120, 427×240 and 854×480. Choose the Video Frame Size (video output resolution) that is closest to one of the supported Connect resolutions. For instance the MX02 Mini does not have 427×240 but it does have 424×240. The same is true for 854×480 but it does support 852×480. If you need to change the input or output parameters you may have to restart the Connect meeting/seminar room in order for the settings to take effect. Luckily this is a simple matter with Adobe Connect, simply refresh the browser tab that was used to launch the meeting/seminar room. Notice that in the Connect video preference settings of your meeting room there is a slider with four steps (settings). Each of the slider steps corresponds to a particular resolution, frame rate and compression amount. At this point we are only concerned about resolution. The following shows the resolution for both the 4:3 and 16:9 aspect ratio for each setting on the slider from right to left (highest being on the far right of the slider). 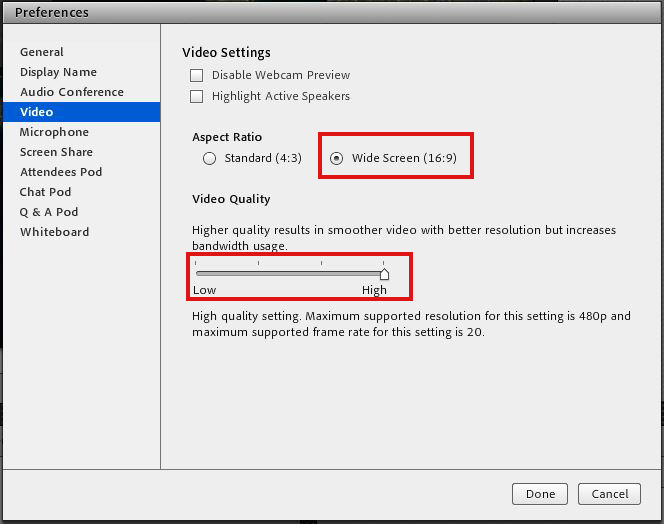 As an example, if your output (Video Frame Size) on the Matrox USB Webcam Emulator was set to 852×480 you would want to use the following settings for the video preferences in the Adobe Connect meeting/seminar room. 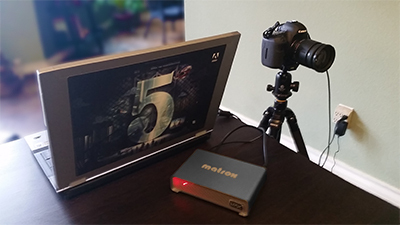 I found the Matrox MX02 Mini, Canon 5D Mark III and Adobe Connect to be a great combination. On several occasions I have had discussions with individuals regarding camera quality. There are two elements regarding quality, subjective and objective quality. Obviously each individual can look at the image produced and make up there own mind. In some cases it is helpful to have some objective data to help elucidate the individuals assumptions. To that end I posted a simple test. Simply choose a typical resolution and click the test button. The video that you see show up in the application is not to scale, it is 1/3 scale. The key element is the frame per second metric and the capture size. Not all cameras will support all of these resolutions so you may notice that the capture size is not the same as the resolution that you selected. You should use a browser other than Chrome. In other words Firefox, IE, etc… The reason I say this is that Google decided to write their own Flash player that does not act the same as the Adobe Flash player. As an example if you run this test in Chrome and select a resolution that is not supported by your webcam you will not see the resolution change but if you run this using the Adobe Flash player and choose a resolution that is not supported by your webcam you will see the resolution that is supported. This is a pretty cool ability because you can see what resolutions are supported by your webcam. Some of you maybe familiar with the FLVCheck tool that allows you to check to see if a Flash video is properly formatted. If you are you would also know that it is a command prompt application (i.e. there is no user interface). To get familiar with the ability to use native process support in Adobe AIR I wrapped the FLVCheck tool in a simple Flex application. This is a simple UI that allows you to drag and drop and flv file onto the application so that it can check the format and fix simple issues. This application does not add any functionality to that application all it does is add a user interface. The application is free but I do ask that you register in order to download. You will also find the Adobe Connect custom video pod at the same location after you are registered. If the registration form does not load, clear your browser cache and try again.